The Lazy Tour will see the band play Newcastle’s Cluny 2 on Friday March 2nd at 7:30pm, for the lucky winners! 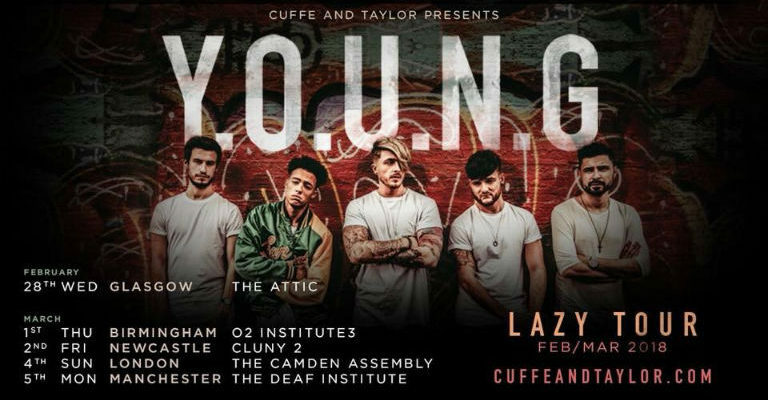 Y.O.U.N.G are already turning heads with their exciting blend of alt-pop, rap and rock having developed a fervent fanbase across Europe where they toured earlier this year. Chez Davies (vocals and guitar) said: “We can’t wait to get out on the road. The Lazy Tour gives us the chance to widen our audience and hopefully pick up new fans along the way. What exciting blend of music is Y.O.U.N.G? A) Alt-pop, Rap and Rock? B) Opera, Classical and Hip Hop?